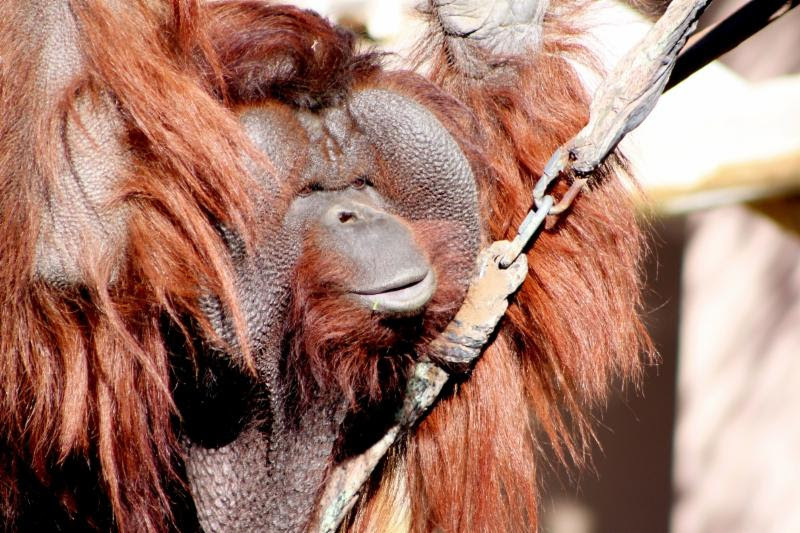 Utah's Hogle Zoo is pleased to welcome full-grown male orangutan, Mia (MY-uh) from Greenville Zoo in South Carolina. The 27 year-old moved into the Great Ape building at the end of September and has spent the last several weeks getting better acquainted with fellow orangutans, 11 year-old Acara and her little brother, two year-old Tuah. Mia came to Hogle Zoo as part of the Zoo's participation in the Orangutan Species Survival Program (SSP). Mia is currently here for companionship though there is a possibility that Mia and Acara may make good partners in the future, but that would be years away. The SSP ensures genetic purity in breeding as zoos accredited through the Association of Zoos and Aquariums work feverishly against the clock to fight for the preservation of this critically endangered species. "He's the most easygoing guy ever," said Erin Jones, great ape supervisor. "They're all learning how to get along as a group of animals they're figuring out likes and dislikes. He's fantastic." Mia is currently on exhibit daily. TODAY, Tuesday, Nov. 15, 11am - Noon. Utah's Hogle Zoo is one of only 232 accredited by the Association of Zoos & Aquariums (AZA). Look for the AZA logo whenever you visit a zoo or aquarium as your assurance that you are supporting a facility dedicated to providing excellent care for animals, a great experience for you, and a better future for all living things. AZA is a leader in global wildlife conservation, and your link to helping animals in their native habitats. For more information visit www.aza.org.